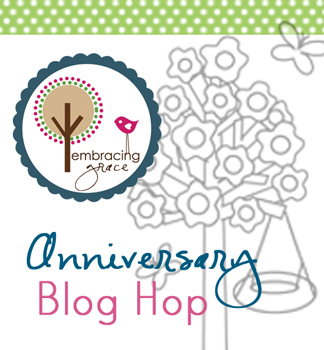 HandKrafted by Stephanie: Embracing Grace Anniversary Hop! I have two posts today. Please scroll down for my Mojo Monday post. Thanks!! Hello! Happy Monday! This month marks the One Year Anniversary of the Embracing Grace collection of stamps illustrated by Emily Burger. To celebrate, the Baker's Dozen is highlighting Emily's very set Love Grows Here. I adore Emily's whimsical designs, and this particular set is my absolute favorite of hers. It was the first Taylored Expressions set of hers, and the images/sentiments can be used all year long! Emily has generously donated two sets of mirror cards from her etsy store to go to one lucky winner (so you can keep one and give one as a gift). The winner will be chosen by a random drawing from all of the comments left on all the posts in today's blog hop (one comment per blog, please) and will be announced in Taylor's blog post tomorrow morning. Be sure to browse Emily's Etsy store - it's full of some wonderful scripture and encouragement items that she has designed! I used the wintery tree scene on my card today. I added a few snowflakes around the tree, but otherwise kept my layout fairly simple. I simply embellished with a felt snowflake and some ribbon/twine. Accessories: Taylored Dies: Make a Snowflake, Mini Tags; Marshmallow Felt (Taylored Expressions); Markers (Copic), Ribbon, Burlap Twine (May Arts); Mica Flakes (Martha Stewart), Button, Hemp Cord, Foam tape, Thread, Sewing machine. Just loving that little tree with the chunky "snow" on it as well as the wavy hill with the snow. 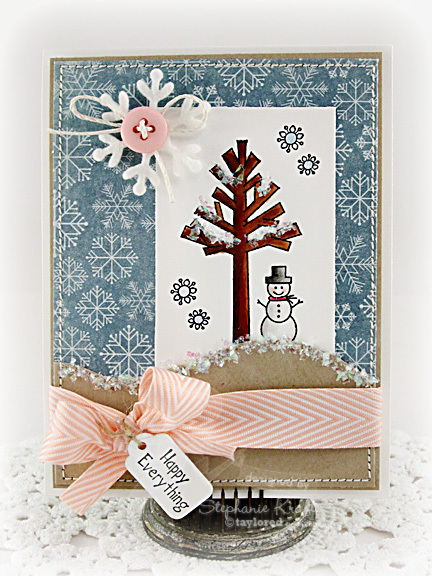 Fabulous card and that snowflake DP has me swooning LOL! Great scarp book page too! Super cute card Stephanie! Love the little snowman and your shimmery glitter. 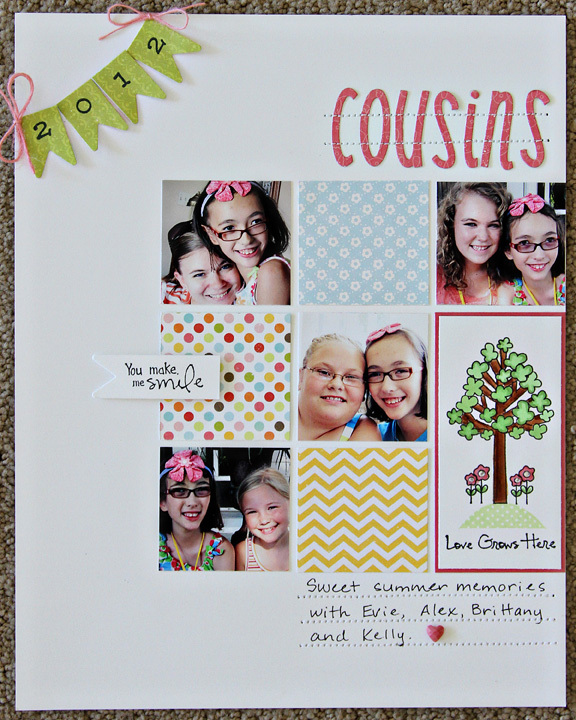 What a beautiful layout of Sabrina and her cousins! Great way to feature so many sweet photos on one layout! Oh my! Two simply fabulous creations! That card is just way too adorable! and the layout is so sweet, and a great design! This is gorgeous! I love how you used the big glitter for snow, it's beautiful! Your layout is perfect... so so pretty!